密蘇里植物園。標本的製作方法。密蘇里植物園pp.14。Bridson,D. & L. Forman.1992. 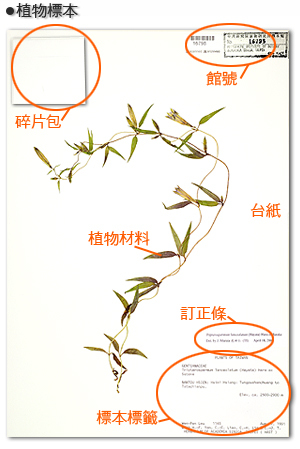 The herbarium handbook. Royal Botanic Gargens, pp.303. Campbell, D.G.1989. The importance of floristic inventory in the tropicos. In D.G. Campbell and H. D. Hammond (eds. ),Floristic Inventory of Tropical Countries. New York Botanical Garden, New York, pp. 5-30. Liesner,R. 19??. Field techniques used by Missori Botanical Garden. Missori Botanical Garden,pp.33. MacFarlane,R. B. 1985. Collecting and preserving plants. Dover publications, Inc.,pp.184. Wightman,G. M. 1989. A simple plant press. Austral. Syst. Bot. Soc. Newsletter 60,p.27.